With Antietam Days Away, Young Leesburg Girl Bore Witness to History. The 1862 Skirmish at Leesburg. See also the Wikepedia article. September 1862 marks Antietam campaign and battle. The Confederate campaign began at Leesburg on Sept. 2, and the battle was fought just 10 miles from the Loudoun County border Sept. 17. The South's 52,000-man Army of Northern Virginia had trekked through lower Loudoun over the dust-filled Leesburg Pike, today's Route 7. It arrived in Leesburg, piecemeal, between Sept. 2 and 4. Junior officers and enlisted bivouacked in fields surrounding the town. One reminiscence about southern forces in Leesburg, to my knowledge never mentioned in print or noted elsewhere, was written by Alice Janney Harrison, who lived at Harrison Hall (also known as Glenfiddich House), a grand home at 205 N. King St. Gen. Robert E. Lee and Gens. 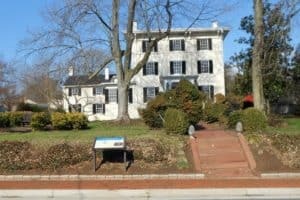 Stonewall Jackson, Jeb Stuart, Fitzhugh Lee and Rooney Lee and other staff officers stayed there and plotted their first invasion of the North. Harrison's home was built in 1848 for her parents, William Tazewell Harrison and Mary Lee Harrison, a cousin of Gen. Robert E. Lee, hence her hospitality toward the officers. Her home also was the largest in Leesburg, built of brick with more than 10 rooms. Harrison was prompted to write her story after she read the 1927 memoirs of Col. Charles Marshall of Fauquier. As Lee's aide-de- camp, he stayed in her home on Sept. 3-4, 1862, when she was 13. Harrison recalled looking out the front window with her two sisters, Maria and Daisy, and seeing "an ambulance stopped by a granite stepping stone and a soldierly figure with both wrists in splints" walking up "the long Box [wood]-bordered brick path." The figure was Lee. Her mother later told her that Lee's horse, Traveller, had given a sudden start while Lee was astride the animal, and "in catching himself, both wrists were sprained and a small bone in one was broken." The Harrisons called on their next-door neighbor and family physician, a Dr. Jackson, to "dress the wrists." Mary Harrison had to feed Lee because of the splints. The girls then ran out to the home's stable on Wirt Street to see Traveller and Jackson's horse. Harrison wrote that she and her sisters "made horsehair rings from Travellor's [sic] mane [that] he left behind in the stall, as a memento." Frank Raflo wrote in his "Leesburg Lore" booklet that "the legend of where Lee's horse slept continues, to be often repeated." The stable still stood then. Today, it does not. However, some horsehair ringlets survive at Richmond's Museum of the Confederacy. 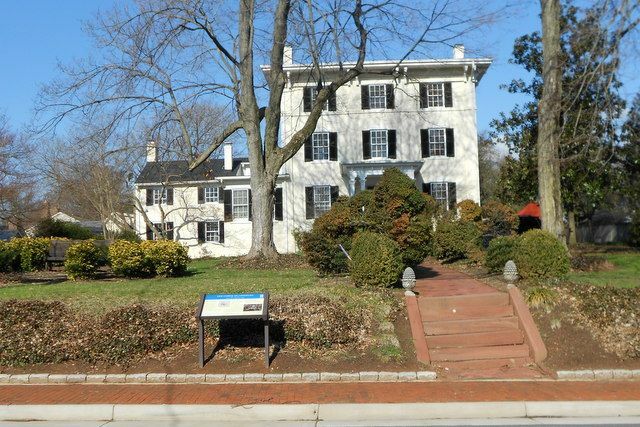 Harrison recalled that she and Maria escorted Lee to the home (now 10 E. Cornwall St.) of John Janney, one of Leesburg's elder statesmen, and on the way, a soldier, not recognizing the general, asked him the way to White's Ford. She wrote that Lee replied "kindly. 'It makes no difference to you my man, keep up with your regiment.' " Several other accounts, including one of Lee's, mention that straggling men, who often stopped to eat corn, were a constant annoyance to senior officers. Writer John Esten Cooke, of the Leesburg-area Cookes, described such "forlorn" men in detail: "worn down by marching and fighting . . . scarcely shoes upon their feet . . . tattered figures, flaunting their rags in the sunshine . . . gaunt and begrimed faces . . . the army was in no condition to undertake an invasion." Harrison did not mention the condition of the men. But Janney was a special person to both her and Lee. Her middle name honored Janney, a politician and lawyer, and it was he who had presented Lee with his sword and commission to lead the Confederate armies in May 1861. "Bob," as Harrison called young Robert Lee, the general's son, also occupied the girls' thoughts and her pen: "Father and son talked together in the northeast corner of the library. Gen. Lee with his hand on his son's knee and Bob with his arm at the back of his Father's chair." The girls "wondered why Gen. Lee let his son remain a private." Harrison said that Gen. Lee slept in the room over the dining room and that "Mr. [Gen. Jeb] Stuart had Prayers in the morning and asked, 'Where is General Lee.' Stuart sat with book in hand waiting and after a little time General Lee came and sat on the sofa." Jackson then came in, sat on the sofa next to Lee and joined the three for morning prayers. The girls were not privy to the officers' conversations regarding strategy, but in his report to Confederate President Jefferson Davis, Lee stated: "It was decided to cross the Potomac east of the Blue Ridge, in order, by threatening, Washington and Baltimore, cause the enemy to withdraw from the south [Virginia] bank, where his presence endangered our communications and the safety of those engaged in the removal of our wounded and the captured property from the late battle-fields [the Second Battle of Manassas]." Lee and his staff officers left the Harrison home early Sept. 4, and the bulk of his army began crossing the Potomac four abreast at White's Ford, behind an Indian rock dam six miles upriver from Leesburg. The ford took the name of Confederate Capt. Elijah Viers White, who in peacetime had farmed its bottomland. Loudoun Lt. Frank Myers, who waded across White's with his men, wrote in his memoir, "The Comanches," that "the wild refrain of 'Maryland, my Maryland,' echoed from a thousand throats" from "the ragged men in gray." Toward the close of Harrison's epistle, she mentioned that Col. Walter Taylor of Lee's staff "came back through Leesburg and spent a night at Harrison Hall on his way to Warrenton. . . . General Lee thought it not wise for him to proceed to the Field as first planned." This snippet links to a little-known second vignette of September 1862, a battle on Leesburg's courthouse green that took place the same day as Antietam, Sept. 17. Returning to Loudoun with Taylor was a reluctant Capt. Elijah V. White , whose personality grated with that of Stuart, his commanding officer. Stuart had told his superior officer, Jackson, that White had "desired to be sent back [to Loudoun]" -- to quote Myers. When White heard Jackson say this, Myers wrote, "before he [White] could explain, his feelings so overcame him that he completely choked down and could not say anything." Finally, White was able to explain that he really wanted to stay with the main army, but Jackson replied: "In the very thing that seems hardest for us to bear, Providence may have hidden a rich blessing for us. Go, Captain, and obey orders" -- again to quote Myers. Initially during the Leesburg battle Sept. 17, it was a blessing that White was there. His command had ridden into town from Waterford so quickly that he had only about 30 men with him. About 90 other Confederates were in Leesburg, guarding the downtown. Many Confederate sick and wounded were resting on the courthouse green. While White's command reconnoitered to the east of town, "[Lt. Col. Hugh Judson] Kilpatrick now, in perfect wantonness, and without any warning," wrote Myers, "opened fire from his artillery upon the town, and the women and children of Leesburg only knew that they were to be bombarded when the shrieking shells came crashing through walls and roofs in the centre of their town." White ordered his cavalry east of town to charge, but he was wounded by a Union volley, and as Myers stated, "This unfortunate affair stopped the charge, which . . . would undoubtedly have routed Kilpatrick's whole force, as citizens on the road [Route 7] reported him and his men to have been very much excited and in great confusion." There Myers's narrative ended as far as the battle at Leesburg was concerned. As with so many Civil War clashes, it took another story to tell us the outcome. Union Col. J.M. Davies's report began at Dranesville in Fairfax County, where "intelligence received . . . raised the possibility of a considerable force [in Leesburg] and Colonel Kilpatrick deemed it best to advance. . . . At Goose Creek he found the bridge away and crossing difficult. The enemy's pickets [White's men] were found at this point." Kilpatrick "advanced on Leesburg, drove their cavalry (numbering almost 200) into the town, and found it occupied by about 500 infantry, including convalescents and armed citizens. A few shells, fired over the town, caused these to withdraw to a wooded hill [Catoctin Mountain] beyond the town." Davies adds, in an afterthought that backs up the report of John Esten Cooke, his adversary: "The whole country, from Warrenton to Leesburg, is filled with sick soldiers, abandoned on the wayside by the enemy." For information about Leesburg during the Civil War, see Richard T. Gillespie's "A perfect sneering nest of rebels" published by the Loudoun Museum in 1998 or "The Advance Guard," a newspaper published by the occupying Union army on March 12, 1862. For the Confederate point of view, see Frank M. Myers's "The Comanches," its 1871 original reprinted by Butternut Press, Gaithersburg, 1987.